Gondolas are one of the attractions of Venice. 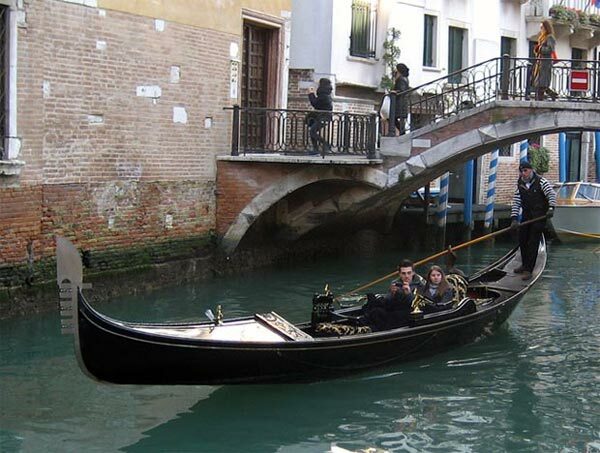 The gondola is a traditional Venetian rowing boat of special form. Gondola can be considered as one of the symbols of Venice. Dimensions and design boats provided by law, from the XVIII century. Boat length is 11.05 meters, width of 140 centimeters. Gondolier steers the boat using only one oar. Currently gondolas used only for entertainment of tourists. The number of licenses issued for riding tourists in gondolas in Venice restricted by law (425). The photo shows tourists in a gondola in Venice.